If you are looking for the best in bespoke events and hospitality in Formula One then these white labelled, high end packages are for you! If you are interested in race hospitality at locations not stated below, please get in touch and we can sort something out for you. The Monaco GP is the highlight of the F1 calendar and considered one of the most glamorous sporting events in the world. There is no better way to view this demanding street race than from the deck of a luxury yacht. If you were however, looking for alternative options, we have a great range of terrace viewing packages around the circuit complete will full hospitality. We are happy to cater to any needs and also have access to fantastic hotels both in and outside of Monaco so please feel free to contact us with any enquiries. Situated on the inside of the circuit between Maggotts Corner & Wellington Straight, this suite gives guests the opportunity to watch the action unfold from a terrace in prime position. Additionally, guests have access to the adjoining VIP Grandstand offering unique panoramic views of six corners whilst also enjoying the very best in VIP hospitality with complimentary food and beverage. Gain a front row seat at the iconic 5* Yas Viceroy Hotel located within the Yas Marina Circuit for Abu Dhabi’s dramatic twilight race and 2016 season finale. 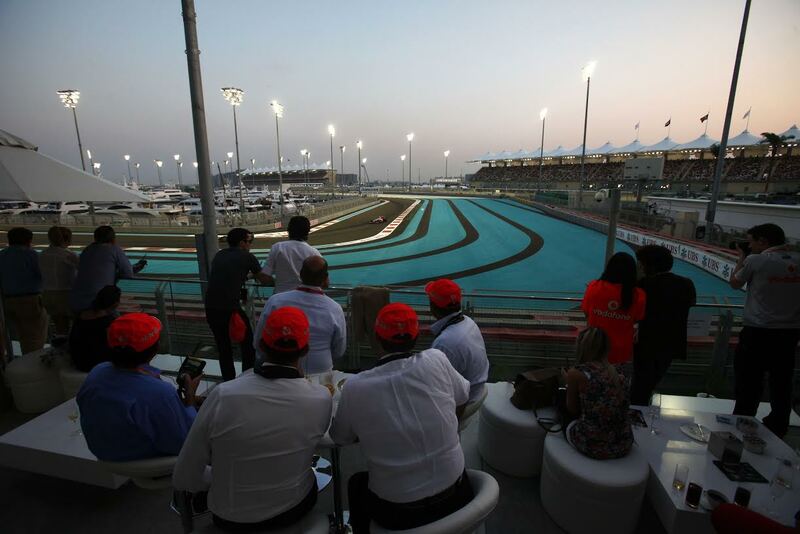 Hosted by our team, you will enjoy fantastic views, including 3 corners of the circuit and the stunning Yas Marina. Guests can enjoy the action from our large trackside terrace, or watch the action on one of the large screens in either the air conditioned dining area or exclusive bar lounge.Throughout the weekend, gourmet buffet cuisine will be served, with open bars serving champagnes and fine wines. There will also be driver appearances on both days with host Q&A sessions, allowing guests personal access to F1 personalities.